$3,999,999 Absolute Luxury! 2 Storey Condo in The Waterford! Welcome to Unparalleled Luxury! Sensational 7,000 Square Foot, 2 Storey Condo in the Prestigious Waterford Building at Lakeshore & Parklawn! This Very Special Property is a Fully Renovated, Custom Designed Two-Storey Unit - an Entertainer's Dream! 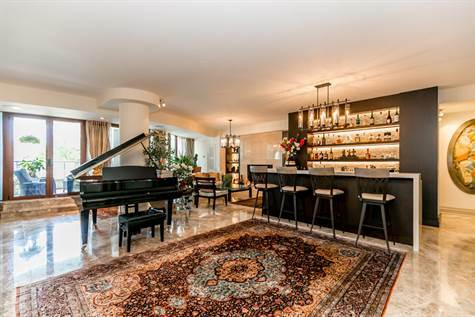 Perfect for a Family - Home-Style Living In Luxury Condo Setting, Massive Wrap-Around Terrace, Master Bedroom Retreat Features Private Sitting Room, His & Her Walk-In Closets, 2 Ensuites With Heated Marble Floors, Spa Steam Shower And Jacuzzi! Gourmet Chef's Kitchen, 9' Ceilings, Floor To Ceiling Windows, 4 Parking Spots, 2 Lockers, Wet Bar & Built In Speakers! Laundry Rooms On Both Levels! 4 Parking Spots With Private Entry To Unit! The World Class Amenities at The Waterford Include a Modern Gym/Exercise Room, a Common Rooftop Deck, Pool, Sauna, Meeting and Party Rooms and Guest Suites. Close To Downtown and Airport. Steps to Lake, Transit & Close to Gardener Expressway!